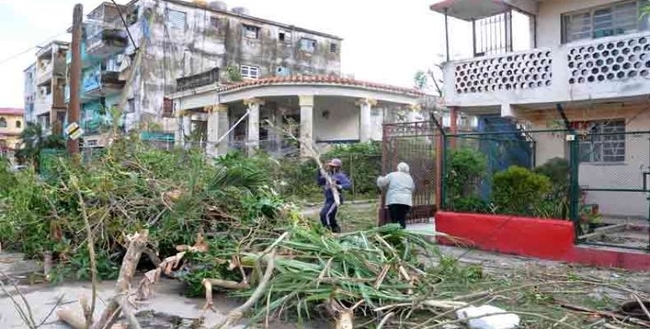 Recovery efforts continue across the capital after a tornado ripped through five Havana municipalities on the evening of January 27. The weather phenomenon caused considerable human and material damage with latest figures reporting four dead and around 195 injured. Meanwhile total and partial building collapses, fallen trees and utility poles; broken doors and windows, as well as overturned automobiles and containers, are among losses reported to property and infrastructure. Local authorities, the military, mass organizations, neighbors, institutions and the general public have all been pulling together since Sunday to support recovery efforts. Cuban President Miguel Diaz-Canel, accompanied by local authorities, toured affected areas in the early hours of Monday morning, during which he witnessed damage and spoke to victims of the freak disaster, offering them words of reassurance and support, and stressing that no one will be left unprotected. Meanwhile, Ministers of Health, Construction, Communications, Water Resources, and Energy, among others, reported on damage and work underway to rebuild and reestablish services. Outpourings of love, support and solidarity from in and outside of Cuba have been flowing ever since the news of the disaster broke. Cubans have been mobilizing from the outset to aid recovery efforts and support fellow inhabitants. People have been working directly in affected neighborhoods alongside official brigades clearing debris and rubble, while others have been donating material goods and opening their homes to friends and neighbors affected. Minister of Foreign Trade and Investment Rodrigo Malmierca recently reported that donations from outside the island can be made by national or regional governments, companies, NGOs, or individuals through the Ministry of Foreign Trade and Investment to ensure that relevant tax and tariffs exemptions are applied and that donations are distributed to those in need. Meanwhile the same system applies to Foreign companies based in Cuba that want to make financial or material donations. According to the Cuban official bank, accounts in Cuban National and Convertible Pesos have been set up to receive monetary donations. The account number for donations in CUC is 0300000005093523, through Cuba’s Banco Financiero Internacional, while national pesos can be deposited in account number 0598770003953216 at the Banco Metropolitano. Here at Radio Habana Cuba we thank you for your support and solidarity at this sad and testing time for the country. But be assured, like always, the Cuban people will overcome! You can also donate via the British Cuba Solidarity Campaign Tornado Appeal here. CSC has already made an immediate transfer from its own funds of £2,000. To avoid high individual bank transfer charges, and difficulties transfering money to Cuba due to the blockade, CSC is collecting individual donations and transfering them in bulk to the official Cuban account for tornedo relief.